As an undergraduate student, I remember reading about settler-Indigenous relations and how some of the problems the relationship could be attributed to cultural misunderstandings. This was a theme within some of the historiography, particularly as it related to treaty negotiations. 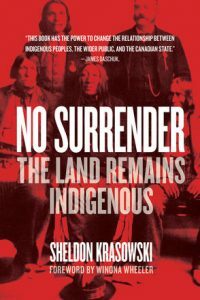 In his new book No Surrender: The Land Remains Indigenous, Sheldon Krasowski challenges this idea and demonstrates how treaty negotiators for the federal government misled First Nations, particularly when it came to the surrender clause. By looking As a result, the numbered treaties signed in the 1870s were not defined by cultural misunderstandings, but rather a concerted effort to deceive First Nations during negotiations. In this episode of the History Slam, I talk with Professor Krasowski about the book. We talk about the tactics used by the government, the motivations of individual agents, and how outside pressures influenced negotiations. We also talk about how treaties influence contemporary discussions and working towards Reconciliation.